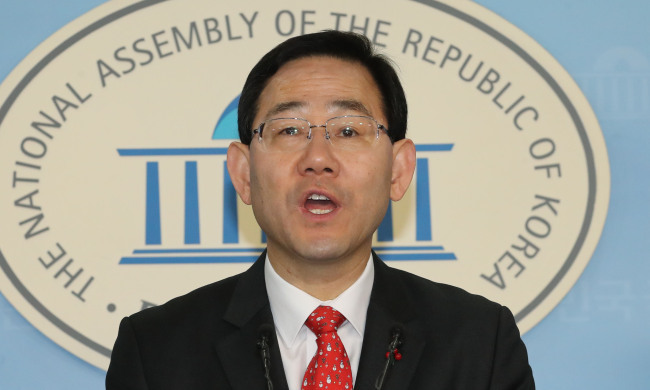 Four-term Rep. Joo Ho-young declared his bid Sunday to run in the main opposition Liberty Korea Party's leadership contest slated for next month, vowing to heal internal division and unite the fractured conservative bloc. His entry into the increasingly crowded field of potential candidates for the Feb. 27 election came as the conservative party is pushing to reform itself, shore up public support and regroup in the face of the strong liberal ruling camp. "Now is the time when we desperately need a new figure who can break the old mold and create a new one," he told a press conference. "The party should not be driven by political goals or ambitions of one person and fissures should not be widened any further," he added. Joo also underscored the need to bring together political conservatives. "Should I become the leader, I will ensure conservatives from outside will join our party," he said. The lawmaker also pledged to introduce a "project to nurture presidential candidates" under which the party can help promote their strengths and complement their shortcomings while shielding them from any negative campaigning. Reps. Kim Jin-tae and Ahn Sang-soo have already declared their bids for the party leadership. Former Prime Minister Hwang Kyo-ahn plans to declare his bid for the party helm Tuesday, sources said. LKP interim leader Kim Byong-joon has opposed his pursuit of the top post on concerns that his former ties to ousted President Park Geun-hye could weaken the party's reform endeavors. Former Seoul Mayor Oh Sei-hoon and former party leader Hong Joon-pyo have also been bandied about as potential candidates. They are expected to make public their intentions for the election as early as this week.